THE PACE of change hasn't been kind to the Mercedes-Benz S-Class flagship, the longstanding last word in luxury, technology and status. New features and functions were once the exclusive preserve of the big limousine, filtering down eventually to smaller stablemates. That process has been up-ended in the rush for bragging rights for new gizmos and the shift to SUVs as our preferred mode of transport. 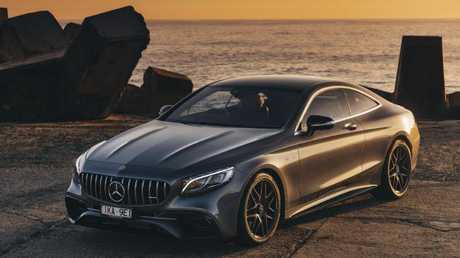 Now the facelifted S-Class coupe and cabriolet inherit tech from the E-Class and miss out altogether on the latest infotainment interface, which will debut in the A-Class hatch in a couple of months. 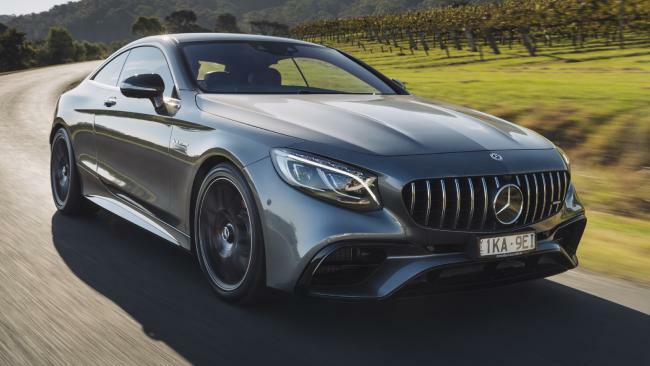 2018 Mercedes-AMG S63 coupe: Outstanding two-door styling. The S-Class still dominates as the most opulent and indulgent vehicle in the Mercedes catalogue. 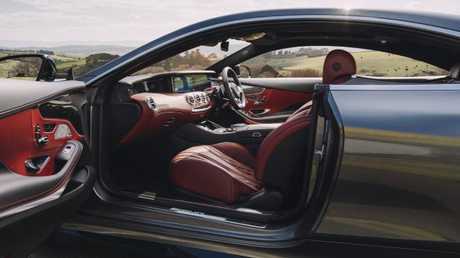 In the just-launched coupe, it also covers its less practical two-door form with some of the best sheet metal seen on a large limousine - only another well-sculpted beast, Bentley's Continental GT for example, can elicit this much attention. Powering the S560 and S63 variants now on sale in Australia is a 4.0-litre V8 twin-turbo. It resonates, at least from outside the car - acoustic glass and insulated panels shield the cabin from outside distractions. 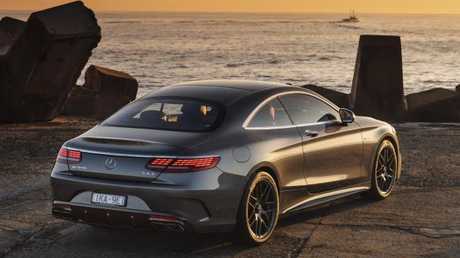 Acquiring an S-Class coupe starts at $314,900 plus on-road costs for the S560. The S63 is a $370,500 proposition. Opt for the cabrio and the S560 ticks off at $336,900, with the S63 starting at $399,900. Default gear in the S560 runs to massage seats, mood-enhancing sounds and smells, a pair of 12.3-inch digital displays, 21-speaker audio, wireless phone charging, power closing doors, digital TV tuner and lashings of leather, wood and metal trim. S63 coupe: Opulence, prodigious power and ample active safety equipment. Active safety is as good as you'd expect at this money. Lane-keep assist has the most natural feel of any recent car as it calculates how to negotiate a corner. 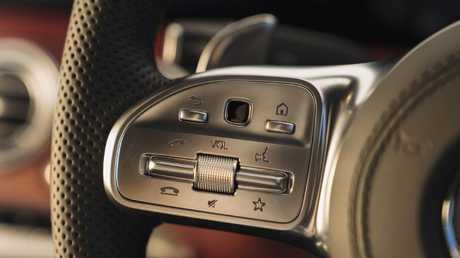 There are adaptive cruise control and autonomous emergency braking up to 250km/h. The car rides on adaptive air suspension and sends 345kW/700Nm to the rear wheels using a nine-speed auto. The S63 adds AMG's engineering expertise to the suspension and drivetrain. Output from the V8 is boosted to 450kW/900Nm, channelled through a multi-clutch nine-speed auto. It also picks up a sports exhaust, performance brakes and bespoke steering wheel. Cabrios have "Airscarf" neck warmers along with heated steering wheel, centre console and front armrests. The S63 will be the volume seller among the two-door S-Classes - and after a back-to-back run against the S560, it isn't hard to see why. The "base" car baulks at tight turns taken at pace, where the more than two-tonne mass is determined to keep travelling ahead in a straight line. The S63 doesn't, despite arriving at the same corner faster. It is a telling reflection of just how well AMG has sorted the suspension and chassis control. 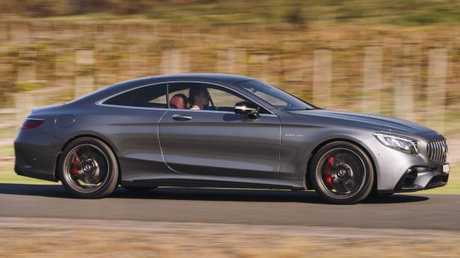 Well-sorted: AMG’s work on the S63 makes it a candidate for top-seller. Grand tourer-style coupes of this size shouldn't be barrelling through backroads, period, but the S63 simply powers through. Point it at sweeping corners and the rear occupants barely notice the curvature. Acceleration is brutal for a car this big. 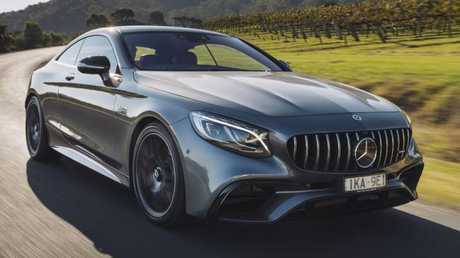 The S560 hits 100km/h in 4.6 seconds; the S63 undercuts that by a considerable margin (official figures aren't available). The brakes are equally aggressive, shedding speed and salvaging pride with only a light prod on the left pedal. Ultimately the S-Class is about travelling in comfort and the S63's body control, whether in hard or soft-top, delivers with verve. Keep your hands away from the sportier buttons and this is driving on a placid lake, except there's no wallowing involved as you slow down. That's a big deal overseas where S-Class owners tend to sit in the back; less an issue here where the ethos is "I paid for it, I'm driving it". matters - it is hard to see how you can be disappointed. TECHNOLOGY More active safety, improved resolution from the dual 12.3-inch screens and smartphone connectivity. PERFORMANCE The 4.0-litre V8 cranks out the same torque and more power than the twin-turbo 5.5-litre it replaces, while using less fuel. DRIVING The 900Nm is about the limit of what can be pushed through the rear wheels while still staying civil. Expect the next S-Class to pack all-wheel drive. DESIGN The front and rear lights come in for an update along with the bumpers - but the exterior is relatively tame compared to the software upgrades.